Isolated thunderstorms during the morning. Cloudy with rain arriving this afternoon. Thunder possible. High 63F. Winds S at 10 to 15 mph. Chance of rain 80%..
Showers early, then cloudy overnight. Areas of patchy fog. Low around 45F. Winds S at 10 to 20 mph. Chance of rain 40%. David G. Hall, age 80 of Errol, N.H., passed away on Thursday April 11, 2019, at his home. He was born in Pittsburg, N.H., on Sept. 30, 1938, the son of the late Vernon and Christie (Hawes) Hall. and was raised and educated in Pittsburg. On July 16, 1960, he married Elsie Eames. He lived most of his life in Errol. His employment included working for Ethan Allen out of high school and being a truck driver for most of his working years. He started driving in the woods at the age of 15 and retired from B. Hall Trucking after many years of employment. David was an excellent trumpet player. He had been inducted into the Basketball Hall of Fame in 1967 for being the coach of the smallest school to win a state championship. 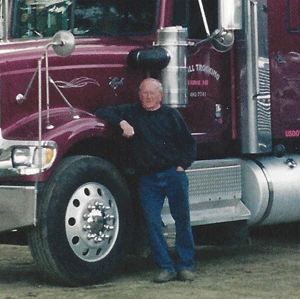 David was also voted Truck Driver of the Year at the Stratton Mill in 1992. Members of the family include his wife of nearly 59 years, Elsie (Eames) Hall; two daughters Lisa Hall and Terri Ruel and her husband Carl; a son Michael Hall and his wife Lori, all of Errol, N.H.; grandchildren Stacey Smith and husband Matt, Julie Wilmot and husband John, Devon Phillips and husband Morgan, Holly Ramsey and companion Justin Beckwith, Benjamin Hall and wife Angela, Meghan Sisino and Brandon Levins; great-grandchildren Aidan and Jackson Smith, Noelle Wilmot, Emma and Rawson Phillips, Gracin Ramsey, Luke and Tyson Shannon and Brantley Hall; nieces, nephews and cousins. He was predeceased by three sisters Rebecca, Verna and Alberta, and a brother Burton. A funeral service will be held on Saturday April 20, 2019, at 1 p.m., at the Errol Congregational Church. Interment will be later in the spring in the Indian Stream Cemetery in Pittsburg, N.H. Relatives and friends may call at the Bryant Funeral Home, 180 Hillside Ave., Berlin, N.H., on Friday from 1-3 p.m. and 6-8 p.m. Donations in David’s memory may be made to the North Country Home Health & Hospice Agency, 536 Cottage St., Littleton, NH 03561. Arrangements are entrusted to the Bryant Funeral Homes, Berlin and Gorham, N.H. Messages of condolence may be shared online at bryantfuneralhome.net. Would you like to receive a link to the Berlin Sun online eEdition and preview the top stories? Signup today!